Brace yourself…your property appraisal notice is on the way. For many of us (really, probably every last one of us), that notice causes frustration and anxiety over being able to keep up with rising property taxes. It also prompts a lot of head-scratching and finger-pointing as folks want to know why this is happening, who’s responsible and how to make it stop. Well, here’s an opportunity for you to get answers to your questions. 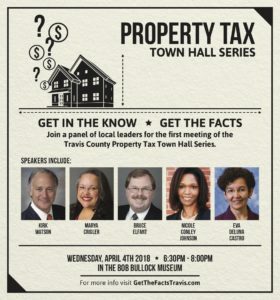 Next Wednesday, the Travis Central Appraisal District will host a Property Tax Town Hall with yours truly as the moderator. We’ve assembled a really great panel of experts to address the nuts and bolts of the property appraisal and tax process as well as the vexing politics that have created this mess. It should be an interesting discussion, and I hope to see you there. We’ll also be putting it online on Facebook if you can’t make it down to the meeting. The failure of those in control of the Capitol to address our broken school finance system means that taxpayers in Austin ISD, in particular, are taking it on the chin. More than half of the property taxes paid to Austin ISD for maintenance and operations this coming year will be sent to the state to help the Legislature cover its own constitutional responsibility to public education. For the owner of the average-value home, the tab for the state will come out to $2,190. That’s a lot of money that most taxpayers probably think is going to help educate the students in Austin schools. But it’s not. Instead, the state is getting the benefit because it frees up state dollars to be used for other things. But there’s some hope for change. Nicole Conley Johnson, the chief financial officer for Austin ISD, is serving on the Texas Commission on Public School Finance, which has been tasked with coming up with a fix for school finance. She’s been doing an extraordinary job on behalf of both the students and taxpayers of Austin ISD. She’ll be one of our expert panelists at the town hall. Folks are rightfully irritated with property taxes, which has some members of the Legislature trying to deflect blame elsewhere. They’ve taken aim squarely at cities and counties. But a true fix to our property tax problem will only come when the Legislature enacts an honest fix to school finance.